In the early 70s, the British government whished an English computer company could compete with the world major manufacturers. Some years later, the ICL company became one of the larger manufacturer of computers in Europe and did really compete with U.S. companies. 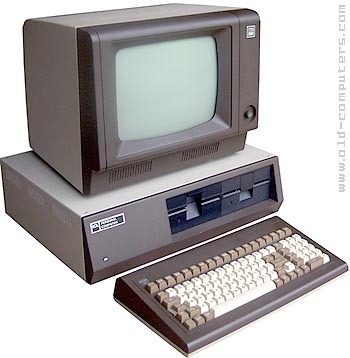 In 1980, before the ICL Personal Computer was born, the company met serious financial problems, the English government paid several million pounds and ICL asked the British RAIR CIE to provide the ICL-PC hardware. This ICL Personal Computer is thus exactly the same machine as the RAIR Black Box system, a backplane 8085 based system using a serial video terminal as video display, and CP/M (single user) or MP/M (multi-user) operating systems. Model 10 (pictured here) - 64 KB RAM, 2 x 5.25" FDD, CP/M O.S. Model 31 64 KB RAM, three users, 5 MB hard disc, MP/M O.S. Model 32 256 KB RAM, three users, 10 MB hard disc, MP/M O.S. Model 15 64 KB RAM, 2 x 5.25" FDD, CP/M O.S. Model 25 with a 5 MB hard disc, CP/M O.S. Model 26 64 KB RAM, three users, 5 MB hard disc, MP/M O.S. Model 35 256 KB RAM, three users, 10 MB hard disc, MP/M O.S. There were a few simple games written for it, mostly text based (what do you expect, it uses CP/M), but it's main use was of course as an office machine. I recall it being a slow machine to use, even boot-up took about a minute. You had to be very careful with the hard disk because it didn't have auto-parking heads. After it was switched off you had to wait about a minute to switch it on again. SIZE / WEIGHT 50.5(W) x 40.5(D) x 14(H) cm. see more ICL Personal computer Ebay auctions !